After the Red Army occupied the Bessarabia region, an agreement was reached between the Third Reich and the Soviet Union (then friends), on the resettlement of the local Germans into the Reich. Serbia, at that time also still friends with Germany, helped out and formed a temporary shelter for the refugees. In the photo, the chairman of the Swabian-German Cultural Union, Dr. Sepp Janko, delivers a speech to his fellow nationals in a refugee camp near Zemun, Yugoslavia, autumn 1940. Behind him are the typical Nazi pagan symbols: the Wolfsangel (freedom) and the Man rune (life), and a shovel (labour) between them. 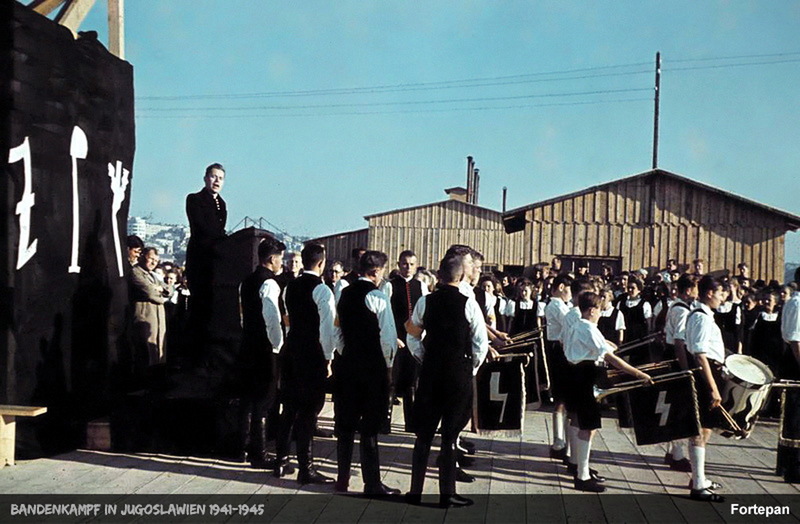 Standing in front are the local ethnic Germans, and their boys in uniforms and with instruments in style of the Hitler Youth. Upon their arrival in the Reich, the refugees will be subjected to the political control, employed mainly as hard labourers, and the able-bodied men will be recruited and sent to war. Two years later, Janko and his men too will put on the uniforms of the German Army, and set off to war – against their former Yugoslav hosts.